The purpose of the Dashboard is to get a quick glimpse of how you or your team are performing. The Dashboard page can be accessed from the main sidebar on the left. Alternatively, you can just click here. The page will display data from the current week by default. To change this, click on "This Week" at the top to expand the Calendar. Click within the Calendar to select a custom date range or select one of the presets at the bottom (This Month, Last Month, etc). Selecting a range longer than 1 year isn't possible. For more details on how the Calendar works open the Selecting a date range article. Click this to compare your current performance with those of the previous period. For example, if the calendar is set to "This Week", clicking on the compare button will compare it to the last week. Grey bars on the right side of your current time bars show the time tracked on the previous time period. Displayed below the bar graph is a list of your most used projects. It will also display a pie chart designed to provide a visual representation of how your time was spent. What is “ Other ” (in my pie charts)? Other is a system-generated category that contains all projects whose duration doesn’t exceed 10% of the total duration. In other words, it’s a way to group together smaller projects so they don’t clutter the pie chart. This grouping is done automatically and cannot be turned off. The Most tracked widget displays a list of your longest time entries created during last 9 days. You can continue any of them by just clicking on a specific entry inside the widget. Team view can be hidden from regular users. If you don't want regular users to have access to the Team view, go to Workspace Settings page and set the “Who can see Team Dashboard” option to “Admins”. 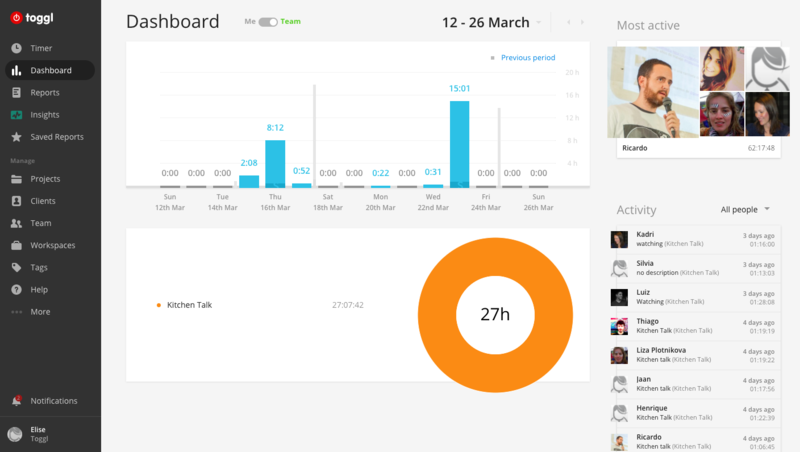 Displays a scoreboard of up to 5 team members who have tracked the most time during last week. You can see the persons time tracking sum when hovering on their picture. Shows an overview of your team’s recent actions. It shows in real time who is currently tracking time (shown in white) and who has recently tracked (shown in gray). You can set the widget to display the latest 20 entries by clicking on the "All people" button and changing the setting.